As part of a multi-day birthday celebration for the little baby, we decided to bring him to the zoo! It was Ted’s first visit to the zoo, and because we thought it would be a long day, we brought along a stroller, a lot of baby snacks and accessories as well as a grandparent. Grandma K had taken a day off from work just to celebrate the little guy’s birthday with him and was very excited to be part of Ted’d first excursion to the zoo. Thankfully, the weather was great – the morning wasn’t too hot and although we thought it might rain, it did not. The weather was nice enough for Ted to take a 1.5 hour nap while we explored the place by ourselves. 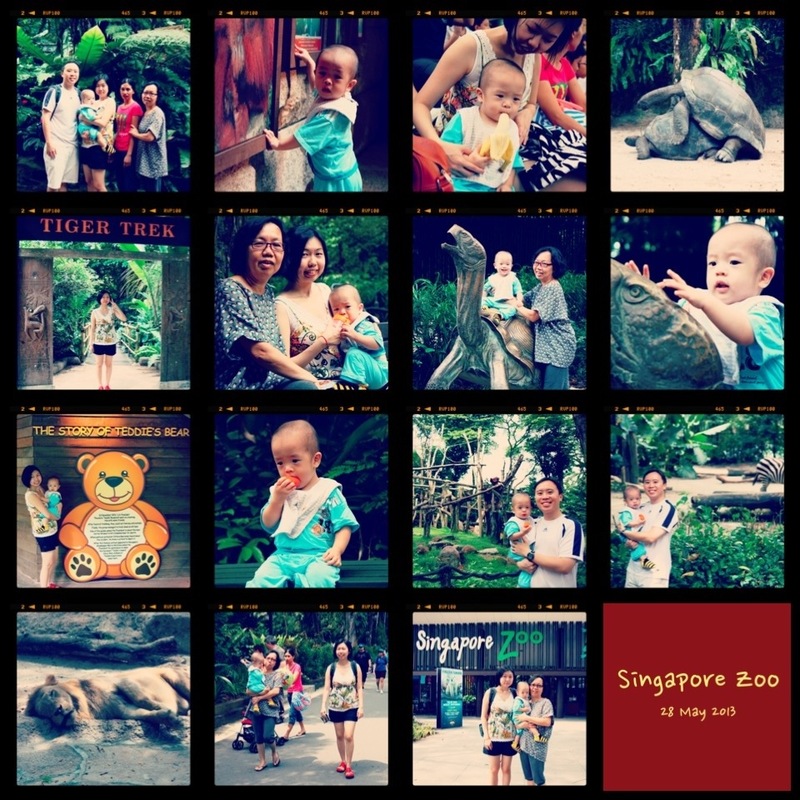 We had brought along our helper as she had never been to the zoo and we introduced to her the history of Ah Meng our famous orang utan among other animals. Ted finally woke up at the Giant Tortoise enclosure because there were two huge tortoises mating and making a whole racket about it. I never even knew tortoises made sounds, but apparently the male ones do, and very loud sounds they make too. Loud enough to wake a sleeping baby who slept through a few crowds of noisy primary school students running about the zoo. Anyway, since Ted was awake, we detoured back to a few of the more interesting enclosures and pointed out animals such as the giraffe, the zebra and the lion to him. It was certainly much more fun than just pointing to animal pictures and saying their names. Ted looked surprised at most of the animals we pointed out – it was probably his first time seeing big live walking animals other than humans. We also managed to squeeze in some time to see the Splish Splash show where the seals gave a great performance that Ted enjoyed over a banana. All in all, it was a great experience for us. I love the open concept of the zoo and love that we can see the animals roaming in their (almost) natural habitat. I love being able to point out random animals and describe what they are doing to Ted. If the tickets weren’t so expensive ($22 per entry per adult), I would most certainly like to make it a regular visit.